We surprised a random subscriber with a new car!! Thanks to SeatGeek for sponsoring the video. Use code DAVID for $20 off your first order: https://sg.app.link/david NEW PINK MERCH IS HERE: https://fanjoy.co/collections/david-dobrik SUBSCRIBE TO JOE HE IS GREAT: https://www.youtube.com/watch?v=8YeIi3_ZEks GO TO MY INSTAGRAM FOR MORE CONTENT: https://www.instagram.com/daviddobrik/?hl=en CHECKOUT OUR PODCAST WHERE WE TALK ABOUT RELATIONSHIPS: https://itunes.apple.com/us/podcast/views-with-david-dobrik-and-jason-nash/id1236778275?mt=2 ADD ME ON SNAPCHAT TO KEEP UP WITH OUR VEGAS TRIP: @Daviddobrik WATCH MY NEW HOUSE TOUR HERE: https://www.youtube.com/watch?v=C4yECzFCdZk&t=26s Comment how much you love our bunny if you read this!! ADD ME ON SNAPCHAT TO BE INVITED TO OUR HOUSE NEXT: @DavidDobrik Thanks for watching :) Throww it a like if you like throwing stuff! Turn my notifications on these to be the next shoutout!! 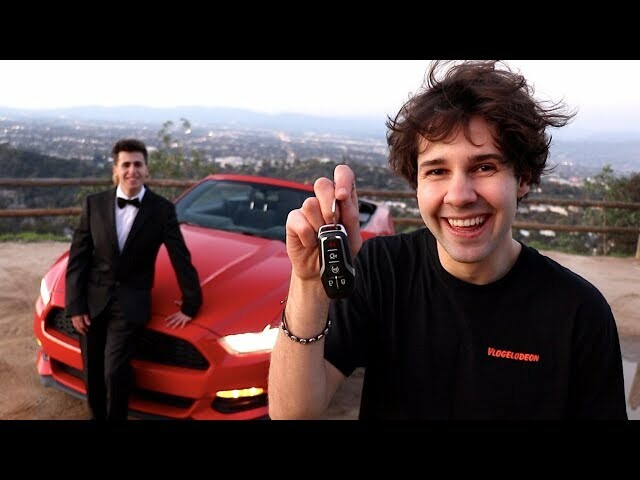 Twitter: @DavidDobrik Instagram: @DavidDobrik Snapchat: @DavidDobrik Vine: @DavidDobrik Musically: @DavidDobrik Business email: [email protected] Other people in the video: Liza- Twitter; @lizakoshy Instagram; @lizakoshy Snapchat; @lizakoshysnaps Alex Ernst- Twitter; @AlexErnst Instagram; @Ernst Snapchat; @AlexErnst Jason Nash- Twitter and Instagram; @JasonNash Josh Peck- Instagram: @shuapeck Twitter: @Itsjoshpeck Snapchat: @joshuapeck Scottysire- Twitter; @imnotscottysire Instagram; @VanillaDingDong Toddysmith- Twitter; @todderic_ Instagram; @todderic_ Zane- Twitter; @Zane Instagram; @Zane Snapchat; @ZaneHijazi Dom: Instagram/Twitter: @DomZeglaitis The Gabbie Show- Twitter; @TheGabbieShow Instagram; @TheGabbieShow Snapchat; @TheGabbieShow Corinna- Snapchat/Twitter/Instagram: @CorinnaKopf Bignik- Twitter: @BigNik Instagram: @RealBigNik Snapchat; @BignikVine Heath- Twitter; @HeathHussar Instagram; @HeathHussar Snapchat; @HeathHussar Seth - @sethfrancois Jonah Hill- Insta: @nickantonyan Brandon Calvillo- Twitter; @BJCalvillo Instagram; @BJCalvillo Snapchat; @BJCalvillo Matt King - Twitter/Instagram/Snapchat: @MattRKing Carly incontro- Twitter/Instagram: @CarlyIncontro Erin Gilfoy- Twitter and Instagram: goddess_eriu Snapchat: erin_gilfoy Jack Dytrych: Twitter: @BigJuicyJack Instagram: jdytrych22 Cailee: Twitter/Instagram: @CaileeRaeMusic Lindsey: @lindseygroll Julia Abner- Instagram; @JuliaAbner Elton Castee- Twitter; @EltonCastee, Instagram; @EltonCastee Meghan McCarthy- Twitter: @MeghanWMcCarthy Jcyrus snapchat: @Jcyrusvine .